The new Paperwhite is our best ever, with a new higher contrast display, the next generation of our built-in light, a powerful new processor, and the latest touchscreen technology. We’ve also added new reading features like Page Flip—skim books page-by-page, or skip through chapters without losing your place. We’ve integrated Goodreads—the world’s largest community of book lovers—so you can connect with like-minded readers, share recommendations and decide what to read next, straight from your book. Our new Vocabulary Builder automatically compiles words you look up in the dictionary into easy-to-use flashcards. And for parents, Kindle FreeTime offers a simple, engaging new way to encourage and reward kids’ reading. 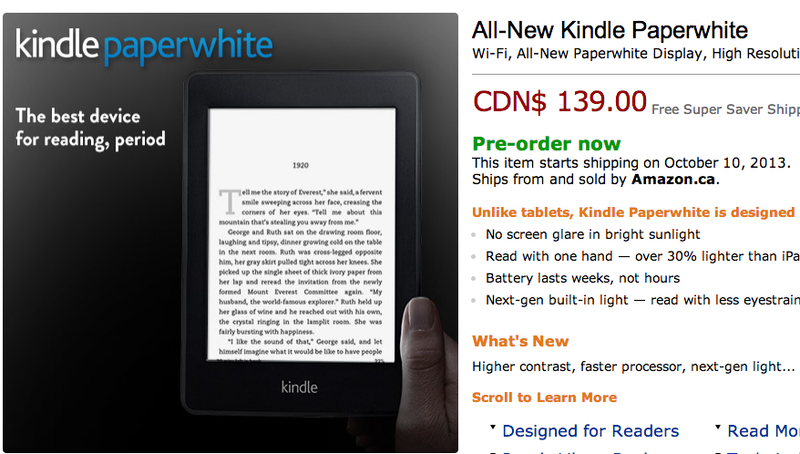 Update: The new Kindle Paperwhite is available for pre-order from Amazon.ca for $139 and ships by October 10.